Interview: In Pinter’s dark play, Norris portrays a threadbare, manipulative interloper who pits brothers against each other as he angles for a cozy setup. At Writers’ Theatre through March 25. The scruffy creature with darting eyes who calls himself Davies looks like his last bed was a cardboard box on the street. He is the elusive but palpably real character at the core of Harold Pinter’s play “The Caretaker,” now on the boards at Writers’ Theatre, and he’s brought to wheedling, calculating life in a masterful piece of acting by Bill Norris. 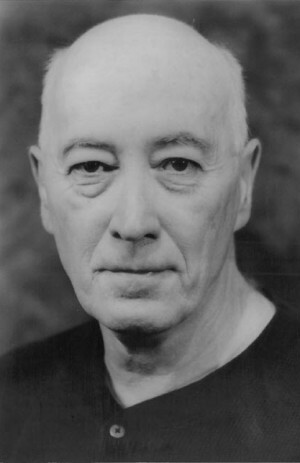 A veteran of the Chicago theater scene whose work here dates back to the 1970s, Norris says playing such a low-life as the parasitic Davies was just a matter of tapping into something within himself. We meet Davies, a weathered and frail old man, in the low-rent London apartment of brothers Mick and Aston, the latter a slow-witted fellow who has rescued the bum from a beating and brought him home. As the stranger lays aggressive claim to his new settlement, the brothers debate what to do with him. Aston (Anish Jethmalani) remains protective of his new charge, but Mick (Kareem Bandealy) suspects the old guy’s motives and mockingly offers him the position of household caretaker. In a recurring leitmotif reminiscent of Beckett’s “Waiting for Godot,” Davies refers periodically to papers awaiting him at a place called Sidcup. If only he could get to Sidcup, he could prove his substance and worth. And tomorrow that’s just where he’s going. Tomorrow. Meanwhile, he must fend off Mick while ingratiating himself deeper with Aston. Davies is a master of angles. Of the three characters in Pinter’s mix, it’s the bum who might at one time have had the best chance to make something of himself, the actor says. The textured naturalism of Norris’ performance is only enhanced by the extreme intimacy of Writers’ tiny venue in which viewers literally line the walls. In more direct input from audience members, at post-performance talk-backs, Norris has heard some remarkable perspectives on a play that’s hard to pin down. “They always have a lot of questions about the brothers,” he says. “Some think the two brothers are only in Davies’ mind. I would never have come up with that interpretation. For that fine edge of tension, Norris credits the liberating work of director Ron OJ Parson. “I want to see that a director knows the script even better than I do,” says the actor, who also has done his own share of directing. “Ron came in not only knowing the script cold, but he also brought a sense of history and of what was going on socially in Britain at the time. It was his idea to cast Kareem and Anish against type, knowing that these East Asians would heighten the sense of racism inherent in Davies. We’re very much into 1962 when the play was first produced. That process still hasn’t stopped, says Norris. “We talk in the dressing room every night – about everything but the show. We let that happen on stage. They’ve never let me down. The blocking, the words may be the same, but it’s the living human being across from me that makes the thing so vibrant at each performance. Photo captions and credits: Home page, top and upper right: Bill Norris. Upper left: Mick (Kareem Bandealy, left) confronts Davies (Bill Norris). 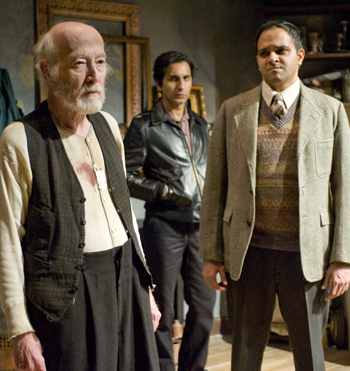 Lower left: From left, Bill Norris as Davies, Kareem Bandealy as Mick and Anish Jethmalani as Aston. (Production photos by Michael Brosilow).